Later this month, Tune In, the first volume of Mark Lewisohn’s three volume biography of the Beatles, The Beatles: All These Years, comes out. I’ve been awaiting this book for five or six years. Lewisohn, the writer behind The Beatles Recording Sessions and The Complete Beatles Chronicle, the the world’s foremost expert on the Beatles, and this set will be the definitive word on the Fab Four, no doubt. The more I hear about Mark Lewisohn’s new biography of the Beatles and the still untold revelations it contains, the more anxious I am to read it. 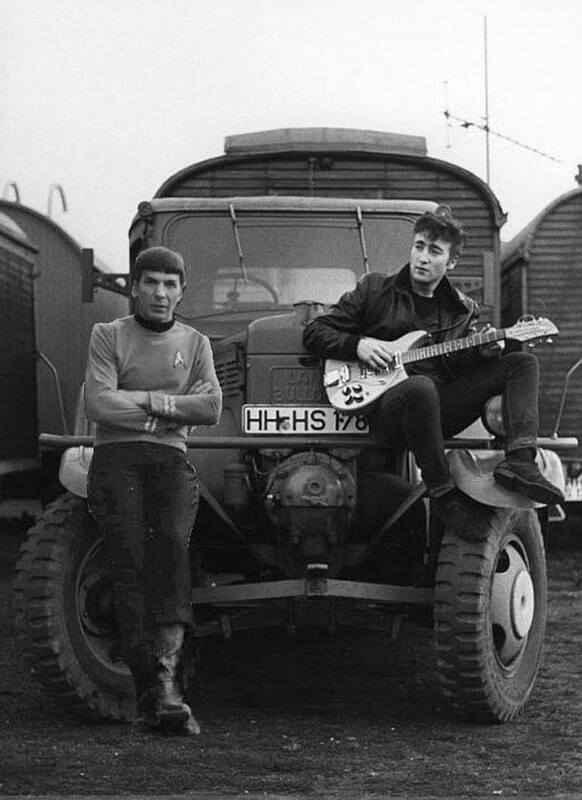 Case in point, this picture of John Lennon and Spock in Hamburg. The rivalry between the Beatles and the Spockamocks in the clubs on the Reeperbahn in 1961 and 1962 has never fully been documented. We know little bits and pieces of the story. We know that Spock fronted a five-piece band that, like the Beatles, performed largely covers of American hits. (Unlike the Beatles, the there are no known recordings of the Spockamocks performing in Hamburg.) We know that, oddly for the Reeperbahn and the heavy sound the bands there had, Spock led the Spockamocks with a lyre. We know a little about the friendship between Stu Sutcliffe and Spockamocks drummer John Harrison. But there’s so much we don’t know. There are rumors that the rivalry between the angry and garrulous John Lennon and the coolly dispassionate Spock boiled over into violence shortly after Stu Sutcliffe announced he was leaving the Beatles. Was it because Lennon was taking out his anger at Stu on Spock? Was it because Lennon tried to raid Spock’s line-up for a replacement bassist? What was the relationship between Paul McCartney and Spock. We know that Lennon wanted Spock in the Sgt Pepper cover, like Stu, but McCartney vetoed that. Why? Was there animosity? Did McCartney simply not like Spock? These are questions I hope Tune In answers.